The Concept: This was a party for my daughter’s second birthday so we kept it small with a gentle but delightful Mad Hatter’s Tea Party theme. Guests were invited to wear a mad hat and more ornate costumes if they wished. The theme would also work well for an older child. We live close to Oxford so could nip into the original Alice’s Shop to buy items such as Alice in Wonderland bookmarks and tea bags. The Invitation: I scanned in the spine of an old book and wrote the invitation as if it was an English classic along with an illustration of the White Rabbit. It was Chapter 2 of course as my daughter was turning two. 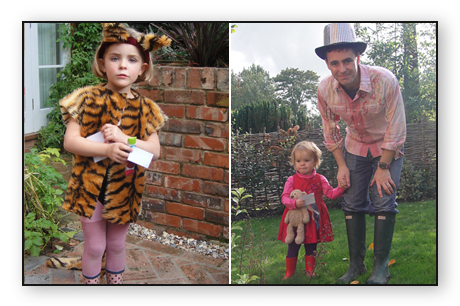 Our Party: This was a family party with a few friends, grandparents and older siblings who enjoyed dressing up as the Cheshire cat and The White Rabbit. My older daughter made maps for everyone to hunt in the garden for their treasure and as she was only 4, the maps were certainly in the spirit of Alice in Wonderland – nonsensical and slightly mad! 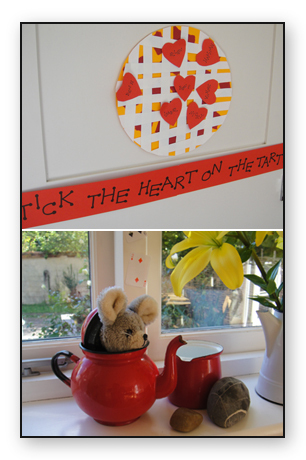 We found our treasure after a fashion (pencils and bookmarks) and returned indoors to play ‘stick the heart on the tart’ – little ones were not blindfolded and it was hilarious to see them still not grasp the idea while parents loved the double entendre. Children’s croquet was set up in deference to the book for older children to enjoy – until the mallets became weapons! 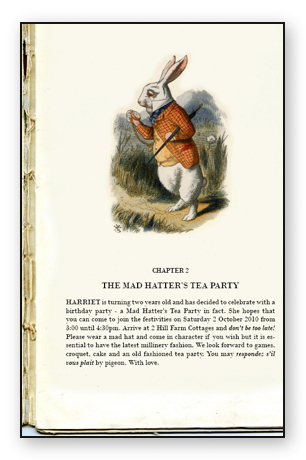 I had fun designing ‘playing card’ table mats and place names and adults received a mad hatter tea bag to take home. 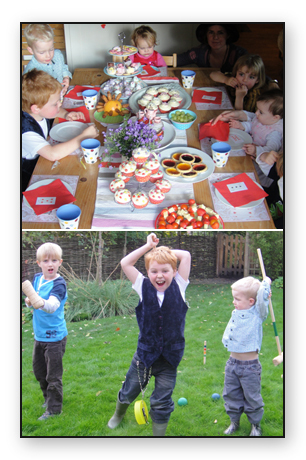 Top Tips: For little ones keep it low-key with easy games and not too many guests. Allow older siblings to become involved in the planning and running of the party as it is hard for them to see a younger sibling being the centre of attention. Keep adults amused with a few touches so that parties for tinys don’t become too saccharine. 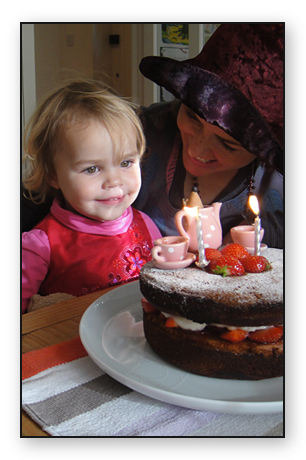 The cake was easy this time – a sponge cake decorated with a miniature mouse and a tea party. This post is part of a mini theme on children’s birthdays. Feel free to share your ideas as comments. The Concept: Cooking is a great theme – the party revolves around food that guests make and then eat so squeeze in as many dishes as possible and choose recipes depending on the age and preference of your child. The youngest age I would recommend for a cooking party would be four years old but this theme will would work well right up to young teens. The Invitation: Have fun with flour and eggs and photograph the results. 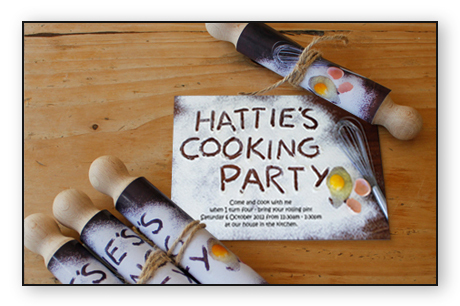 Wrap the invitation around a little rolling-pin to deliver to your guests. 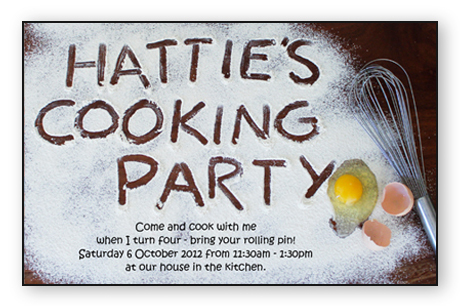 Invitations are important, they set the tone and the theme – but I am a graphic designer so can’t help going to town. 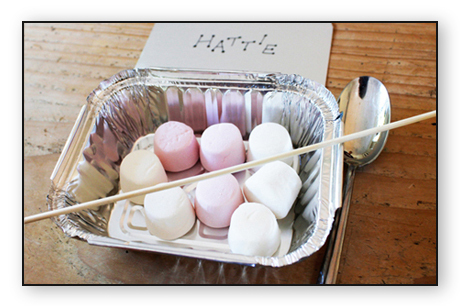 Our Party: When the children arrived they made caterpillar kebabs from marshmallows. They then concocted their own mini pasta bakes in dinky takeaway containers and any leftovers could be taken away to be eaten at home. These chefs work fast so we moved swiftly on to cookie dough and biscuit cutters, strawberry smoothies and highly decorated cupcakes. The children left happy, floury with a party bag containing a wooden spoon and cookie cutter – aesthetically tasteful and hopefully useful! Top Tips: Work out what kitchen equipment you will need and have it ready – you need to be organised! Prep up before hand by making the dough for cookies and baking cupcakes in advance. I use this Swedish biscuit recipe. 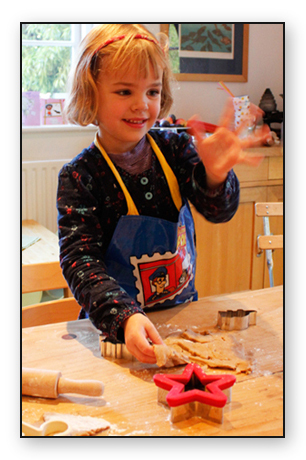 Children can cut biscuits shapes and you can bake them while they decorate the cupcakes. Pizza or pasta is great for a main dish. Have fruit trimmed and ready for smoothies. Have a few simple party games which they can play with one adult if you need time to clear the decks and get ready for the next cooking extravaganza. Have a high proportion of adults to children if very young. Have simple boxes or bags to take home the goodies they don’t manage to eat. This post is part of a mini theme on children’s birthdays. Feel free to share your ideas as comments. Celebrating children’s birthdays is exciting but don’t allow them to overwhelm you. We alternate between birthday treats and birthday parties. One year will be a treat, for instance a visit to the zoo with one or two friends and the following year is a party. With three children this means I’m not laying on three parties a year and the children really enjoy the novelty of a treat with a fantastic picnic and having a special friend to celebrate with. Parties are kept simple with about 8 friends so no mass class parties! If you keep the numbers small enough, you are not obliged to invite an entire class and my rule of thumb is to invite the number of guests of the age your child plus one. Birthdays are emotional times with all the extra attention and your child will cope better if there are not too many friends. For the very young, cousins and grandparents are probably enough. Lavish entertainment is unnecessary and I favour having a theme on which to ‘hang’ the activities and love having traditional party games plus one or two creative ‘wow’ factors. Hiring a bouncy castle at the village hall or trooping off to a soft play centre is unoriginal. If you keep the guest list small enough there is no reason why you can’t entertain and host the party without having to wheel in a professional entertainer. 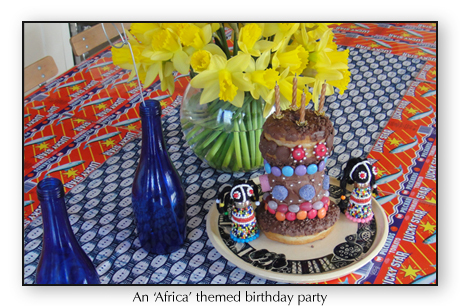 In the next few posts I will suggest 5 party ideas to inspire you. This post is first of a mini theme on children’s birthdays. Feel free to share your ideas as comments. It is a bit of a challenge if you are ‘buying nothing new’ but we had a great time during half-term and seeing that it falls on different weeks in the UK, I thought I would share some ideas if you needed inspiration. Baking is always a good activity even with three mini chefs. Have a go at chocolate brownies – we use the Usbourne children’s book recipe with delicious results. Make family pizza. Keep it simple by buying the bases, whack on some passata and then everyone can add their own pre-chopped ingredients – salami, ham, cheese, red pepper, pineapple, egg and mushrooms. Wrap up warm and go outside to tramp in the countryside or a park as fresh air revives everyone. 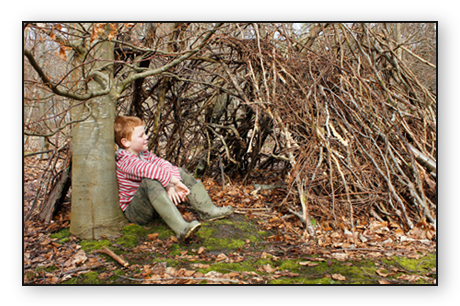 Build a den in which to eat your chocolate brownies. 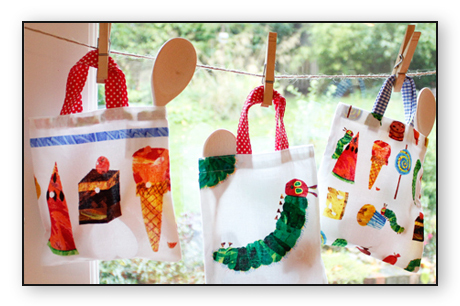 Have holiday projects for your children, you can read more about this on this link. This holiday I introduced origami for my 9-year-old and we made a new model each day. My 6-year-old was desperate to learn to knit so I am teaching her although she is on the young side. If you teach your child to knit, I can recommend thick children’s needles of 5mm or 6mm and multi coloured wool. If the wool is changing colour it inspires children to keep knitting. Visit the site Hulu to buy these items. My son was so interested in knitting that I ended up teaching him too and he is really doing well. Bike rides and picnics can happen even if February. Hire a few DVDs and cheat and watch television in the afternoon. Best of all can I suggest ‘The great family sleep over’! The entire family drags their mattresses into one room and all sleep together on the floor. I probably shouldn’t add that Ella (age 4) wet the airbed that she was sharing with me or that when we woke up we felt exhausted, as if we had been camping but least we could sit in a comfy sofa and drink coffee. Why would a family with perfectly decent beds do this? 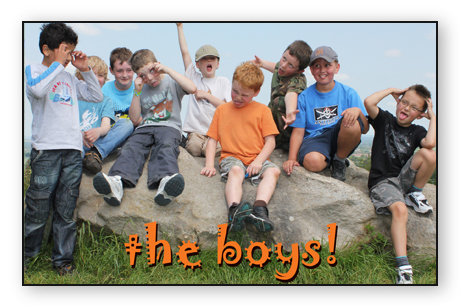 Because it is fun and it was so exciting for the children, creating magical memories. Just like puppies, children need to be taken outside whatever the weather to run off extra energy, have a change of scenery and fresh air. When it is autumn, we find many treasures on our walks, in fact Sophie is such a hoarder that she has a fabric bag called an ‘Item Bag’ to collect the leaves, conkers and creepy-crawlies that we find. Another way of collecting leaves which is aesthetically pleasing is to make a leaf kebab. Find a thin, firm stick which is about 20cm in length or grab a kebab stick from the kitchen then as you wander along collect beautiful leaves and impale them on the stick. 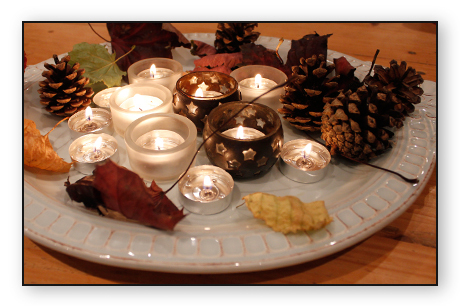 When you return home, place the best of your autumn haul on a platter and light a few tealights to create an ‘autumn focus’ for the table. Creating a bug hotel has been one of our most enjoyable autumn activities. You need a small wooden box about 22cm x 15cm x 7cm which can be bought from www.dandpmarchant.com (6 boxes for £24.99). 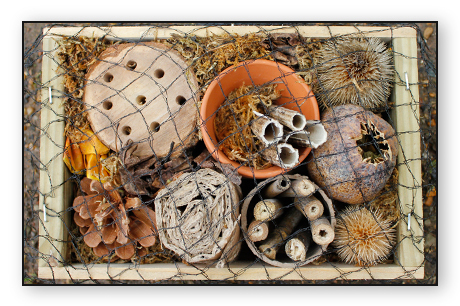 Fill it with autumn finds such as teasel and poppy heads, pine cones, bamboo stalks tied into bundles and rolled cardboard. You can also drill holes in a small log to make beetle homes. 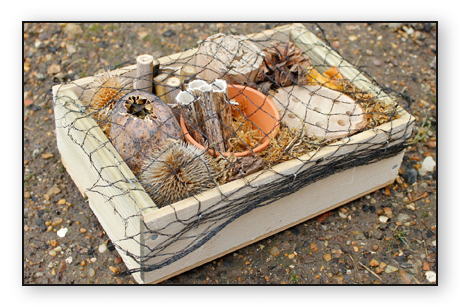 Pack all the items into the box and then tightly fill the gaps with moss and dead leaves. Using a staple gun, staple a mesh over the box so that the items don’t fall out and then position it in a warm, sheltered place. Try and ensure it is out of the rain as bugs don’t like getting wet. 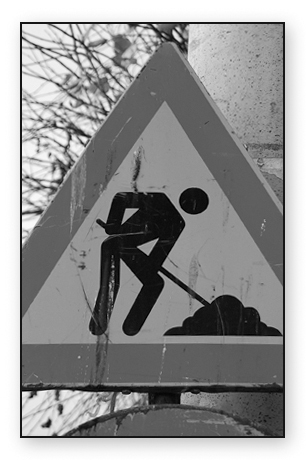 Then wait for the following bugs to move in! Lacewings: Lacewings are bright green with transparent wings. They mostly come out at night and eat aphids on plants. As they don’t survive the winter easily, they will enjoy a nice cosy bug hotel. Ladybirds: Ladybirds also eat aphids and tend to spend the winter hidden in nooks and crannies of dead wood. Red Mason Bees and Tawny Mining Bees: These both help to control insects in the garden. They are solitary bees so don’t live in hives with other bees. They like to spend the winter in hollow stems or holes in wood.